Late eighteenth-century industrialists, farmers and physicians who actively employed chemistry are historically hazy figures. This is not only the case for scientific histories, but also for studies that address the socio-economic factors of the Enlightenment. 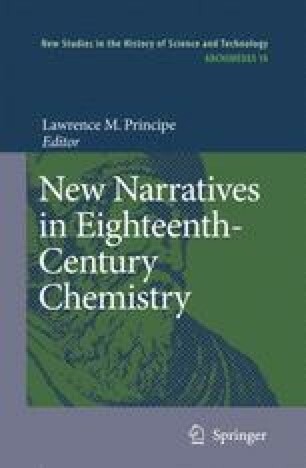 Up until the late twentieth century, historians of chemistry tended to focus on ideas and personalities that nineteenth-century scholars deemed to be important to Antoine Lavoisier’s oxygen theory of combustion – a practice that fell in line with the more ubiquitous ‘Great Man’ approach to history. Such a move privileged the idealized space of the laboratory, thereby ruling out experiments performed in situ in homes, farms, mines, factories, or fields. The result was a historiographical disposition that assigned a causative role to the chemical concepts developed in conjunction with the instruments and methods attributed to laboratory settings: an act that reconfirmed the status of canonized chemists, and implicitly made them central nodes in knowledge networks that honed and dispersed the theoretical framework of chemistry. Although this model was conceptually useful (especially in light of the accessibility of primary sources), it effectively marginalized provincial chemists (among others) by placing them at the end of a long chain of ideas that emanated from a distant expert. Such a one-directional approach treated local chemists as if they were intellectual automatons waiting to be directed by an unseen hand.